Keep it simple. Taking advantage of powerful, new Internet technology doesn't mean giving up the familiar. 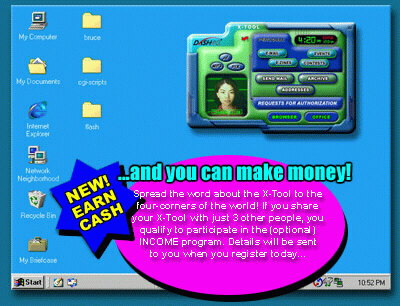 The X-Tool gives you the ability to access the extraordinary Dash Viewer ( browser ) where you can view and navigate web pages, email in HTML format, or browse the product and services information you’ve requested from advertisers. You can also use the DashViewer to compose email - incorporating video, audio, graphics, texts and forms - on the fly.